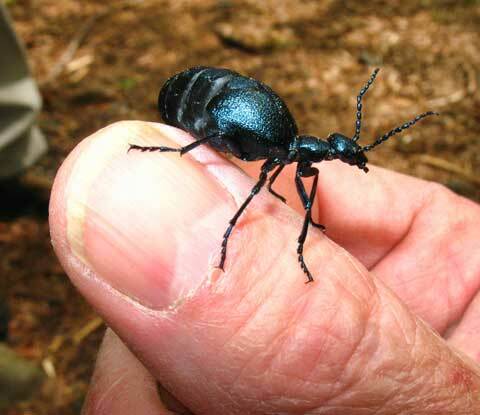 If you look in Google Images for this flightless creature that looks like an obese steel-blue ant, you’ll not find another picture among the many of this insect in a human hand—like the one you see here perched on my thumb. There’s a reason for that: others realized that this insect belongs to a group of beetles called “blister beetles” because it exudes a caustic excretion from its leg joints. I knew it was a beetle but not about the blister part. I will note, however, that I never intended to EAT the thing, and knowing this, the inch-long ant-looking beetle did not panic, even while it did not cooperate, and avoided looking at the camera no matter how I turned it. “In at least one Meloe species, the larvae climb to the top of a grass or weed stalk as a group, clump together in the shape of a female solitary ground bee, exude a scent that is the same as, or closely resembles, the pheromones of the female bee, and wait for a male ground bee to come along. When he does, he tries to mate with the clump of larvae, whereupon they individually clamp onto his hairs. He then flies away, finds and mates with one or several real female bees, and the larvae transfer to the female(s). Each impregnated female bee then flies off and builds one to several nests in burrows she digs in the soil, and the larvae transfer again to the new nests. The female bee stocks these nests with honey and pollen for her own young, but the hungry blister beetle young are there to gobble up the provisions. They eventually pupate and finally emerge as adult flightless beetles. Brothers and sisters find each other and mate, produce eggs and the hatchlings start the process all over. Then there are male beetles from a couple other beetle families who seek out blister beetles, climb onto them and lick off the cantharidin the blister beetles exude. Not only have these other beetles developed a resistance to the cantharidin, they use the blistering agent to impress a female of their own species who then mates with them, whereupon most of the cantharidin is transfered to the female in the form of a sperm packet. The eggs the female subsequently lays are coated with cantharidin to protect them from being eaten before they hatch.